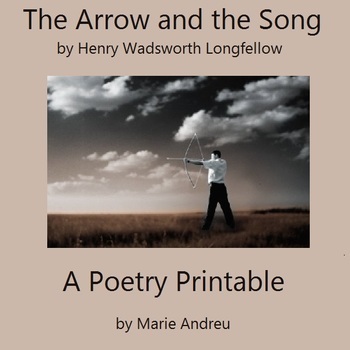 This 2-page printable on Henry Wadsworth Longfellow's "The Arrow and the Song" contains the poem itself and 8 short-answer questions for students complete. 1. 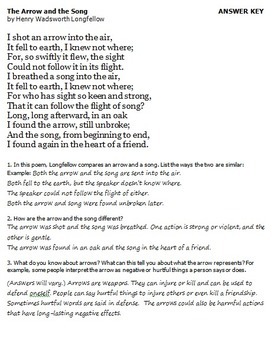 Use this printable as start of class work, homework or other assignment to supplement a similar theme in other literature your class is reading. By itself, this handout will take students 10-15 minutes to complete. 2. Use as a sponge activity, extra credit, or additional work for students who finish another assignment in class early. This is a good activity when a lesson runs shorter than expected or a change in the regular school schedule requires you to fill 10-15 minutes. 3. 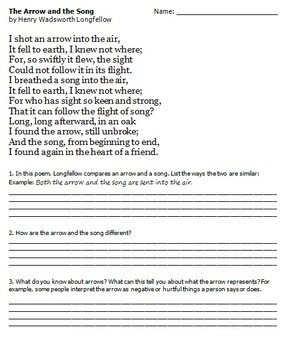 Have students complete the printable as a springboard for discussion and/or an essay. Used in this way, this activity can take an entire class period. 4. If your school has an advisor/advisee program, this printable can supplement lessons on bullying, making good choices, and a variety of other advisement themes. 5. Keep a copy in your emergency lesson plan folder along with a plan for a sub to use. 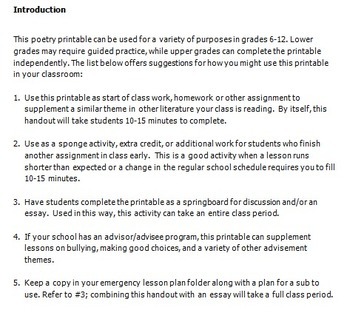 Refer to #3; combining this handout with an essay will take a full class period.